Word cloud making technology has been something I’ve played around with for a while. You paste in a bunch of text into the website and it analyzes it by how often you use each word, discarding filler words like “I” and “don’t.” The more often a word occurs in the text, the larger it appears in the cloud. A few days ago, I got the random idea to paste a ton of my book reviews collectively into a cloud generator. I tried to use Wordle (which I’ve used in the past), but something went wrong with Chrome/Java and I ended up using Word It Out, which actually worked really well and gave me a nice amount of control over my cloud. I used the text from my book reviews for the months of May and June this year: For Darkness Shows the Stars, To Kill a Mockingbird, Since You’ve Been Gone, Graceling, To All the Boys I’ve Loved Before, All American Girl, Uprooted, The Burning Sky, The Perilous Sea, and Dangerous Girls. I removed the plot descriptions from the text, so that the only words being analyzed were my own. 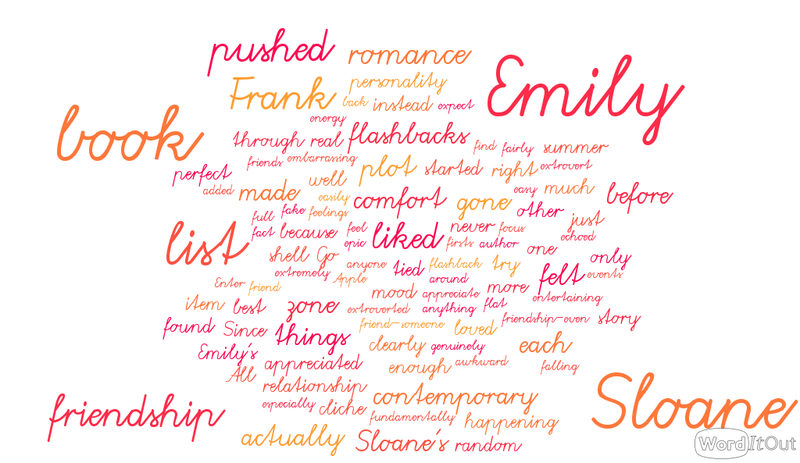 I then played around with the settings, trying to find a word cloud I liked. I used the full size image for this post, so if you can’t see the smaller words in the cloud, clicking on the image should give you a big enough view to see the details. But what did I actually get from looking at the resulting clouds? Book/Story: This one is obvious. Since they are book reviews, I’m doing a lot of talking about well…books and the stories they contain. Romance/relationship: Also, fairly straightforward. 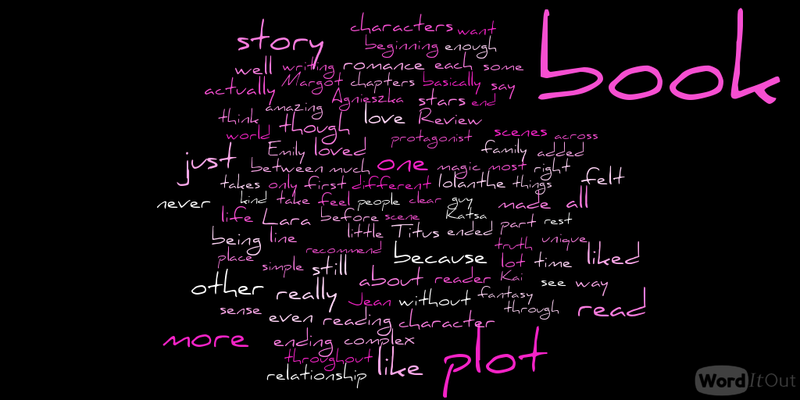 Most of the books I read, being YA, have a central romantic relationship driving them, which I always try to touch on. I did expect these words to be larger, though. Actually/really/just: These are words I can’t seem to keep out of my vocabulary when I’m reviewing books. Half of the time, I enjoy my writing voice, and the other half of the time, I wish my diction was a little more professional. Seeing these words in the cloud gave me an idea of how prevalent they are in my writing. How big plot was: I know I talk about the plot a lot, but in my head I always talked about characters more than I focused on plot. Probably, I still do, I just refer to the characters by their names, but it was still surprising that plot was the second largest (ergo, most common) word. Specific character names: Lots of character names from the books included in the text made their way into the cloud. This shouldn’t be surprising, but I assumed that they wouldn’t have been mentioned enough individually to get to the size they are on the image. The randomness: I’ve made a lot of these clouds before from my fiction writing, and the thing that always stands out to me is the randomness of the words that make the cloud. Everyday words that you don’t even realize you use as often as you do suddenly shine in your face. I always find words on these clouds and wonder “What sentences did I write so that that word made it on here?” For this cloud, the words “guy” and “two” stood out to me. As a bonus, I made some clouds from specific reviews. (Can you tell I was having fun with this?) For these, I tried to use color and font to capture the mood of the book. I love how with these specific clouds, you can actually get the idea of what I was saying just from the words that I ended up using the most. 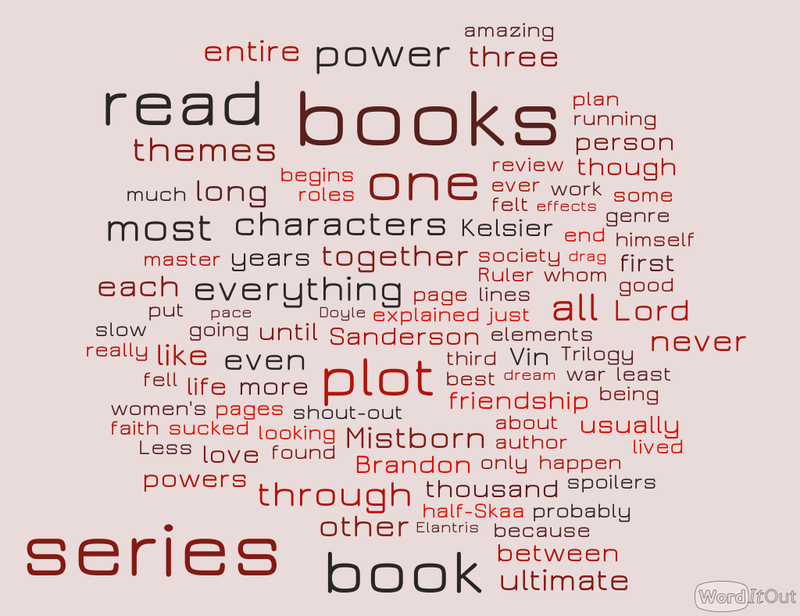 For instance, from my Mistborn series review, you can clearly see that I want people to “read” this “series/book/books” because of the “power” and “themes” and “characters”–“everything,” basically. Have you ever thought of the words you use to write your book reviews? Have you ever put your fiction writing or WIP through one of these websites? What do you think about my clouds? I hope you post it 🙂 It would be cool to compare ours.